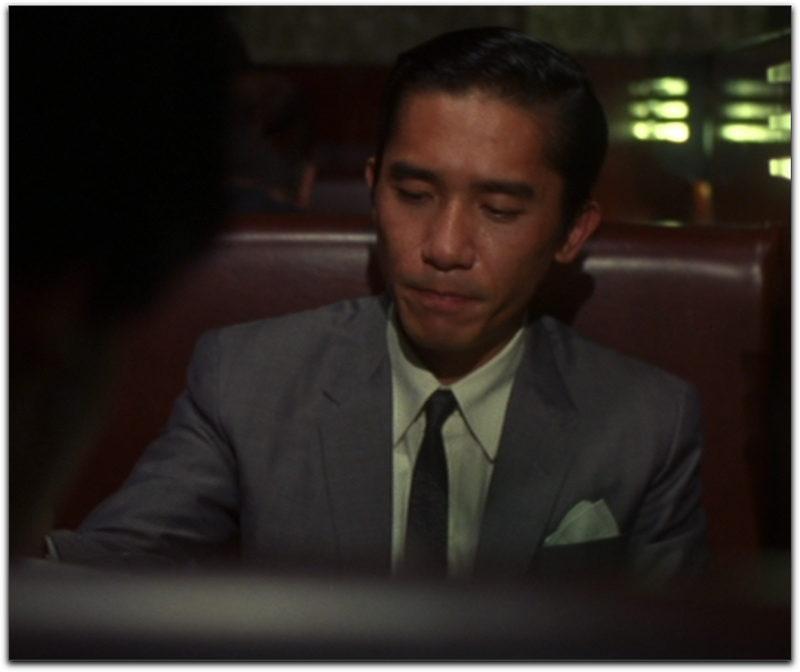 It’s the late 60’s and the streets of Hong Kong are full of social upheaval. 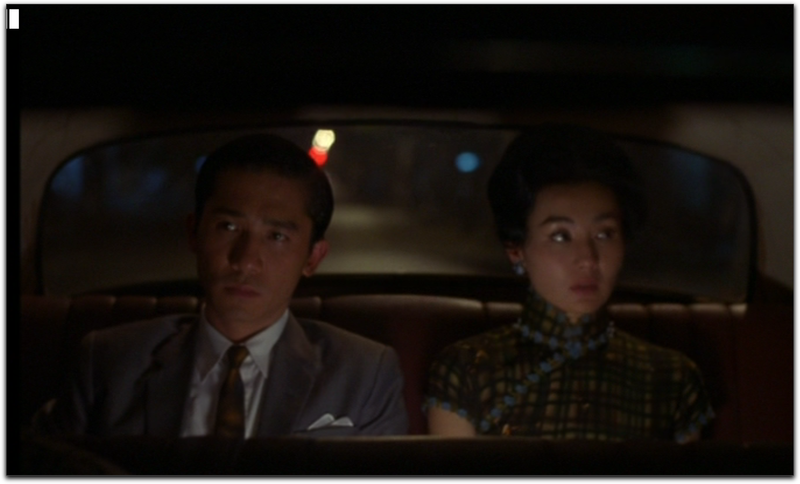 Won Kar Wai’s third film ties “Days of Being Wild,” “In the Mood for Love,” and “2046,” in a loose, frenetic, film bouquet. 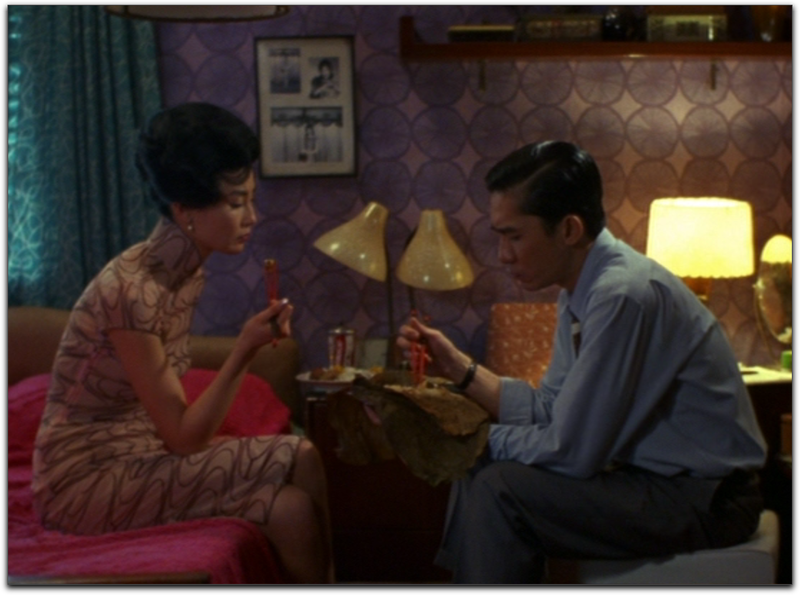 Christopher Doyle, Pung-Leung Kwan, DPs, William Chang Costume and Set Design. 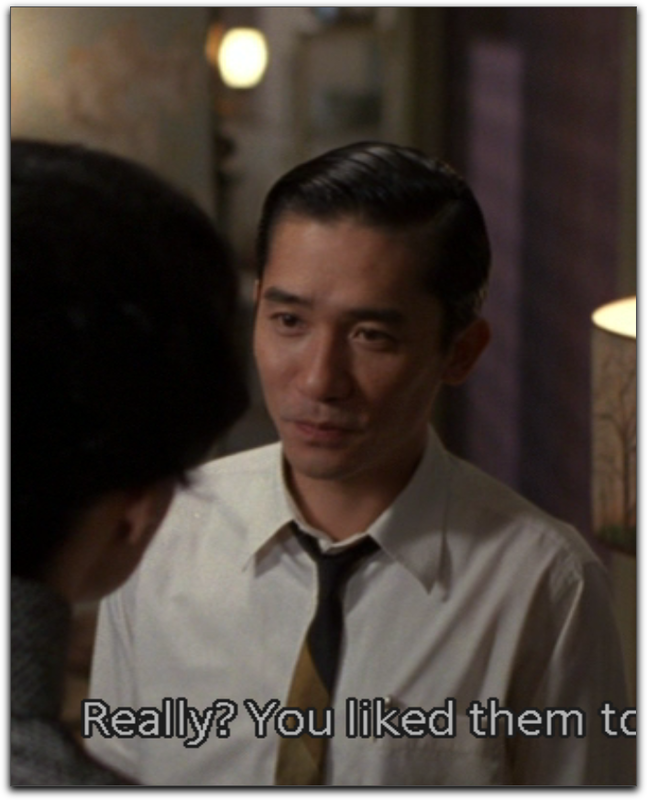 We follow Tony Leung’s Mr. Chow after he returns from Singapore and continues to write his sci-fi serials, and chase women. Maggie Cheung’s, Mrs. Chan is gone, but Maggie Cheung pops up in the imagined future of his serial where everyone is trying to get to a place called 2046, to recapture lost memories because there, nothing changes. 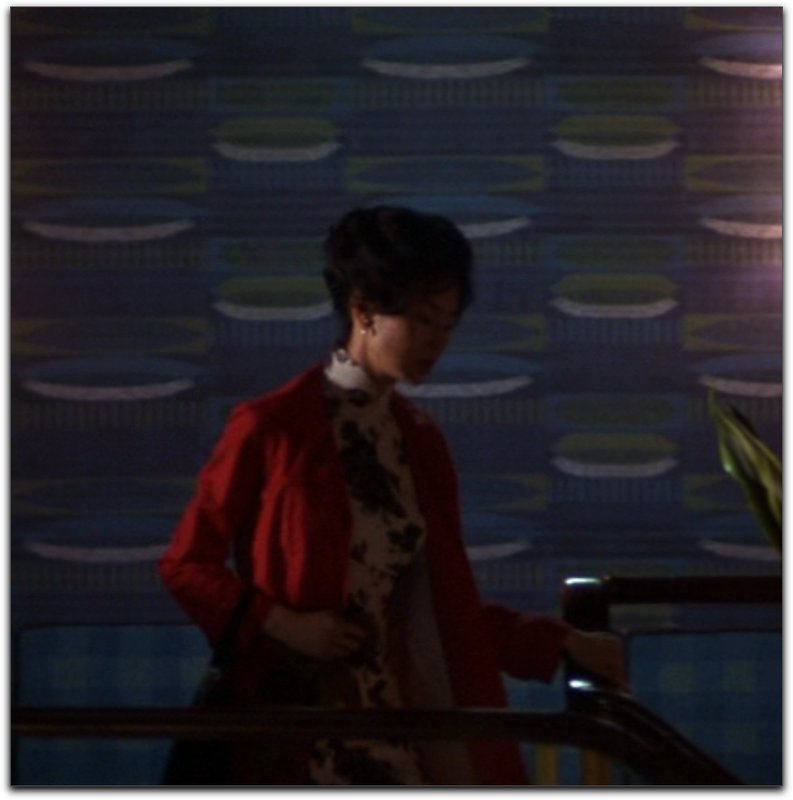 2046 is the apartment number Mr. Chow had many fond memories in with Mrs. Chan (Maggie Leung, from “In the Mood for Love”) and he happens to end up at another apartment 2046, this time with a woman named Lulu. 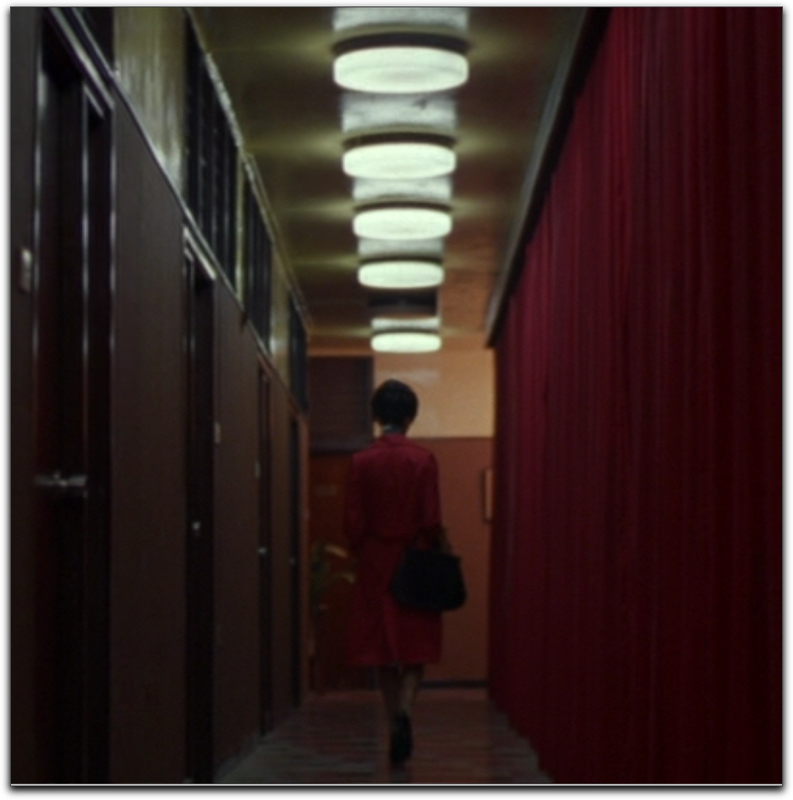 Lulu’s character was first seen in Won Kar Wai’s “Days of Being Wild.” He leaves her in 2046, passed out and drunk, and comes the next day to return her room key. He wants to rent 2046, but unknown to him, Lulu’s jealous lover stabbed her there the night before. He ends up taking 2047 and watches his neighbors in 2046 through a grate at the top of the wall. Faye Wong, Jing-Wen, with a bouffant. She is his heartsick neighbor and daughter of the hotel owner. She pines away for her forbidden love, a Japanese man. A gorgeous shot of her in a red dress with her love. Here's closer look at her neckline, love the tiny cap sleeves. 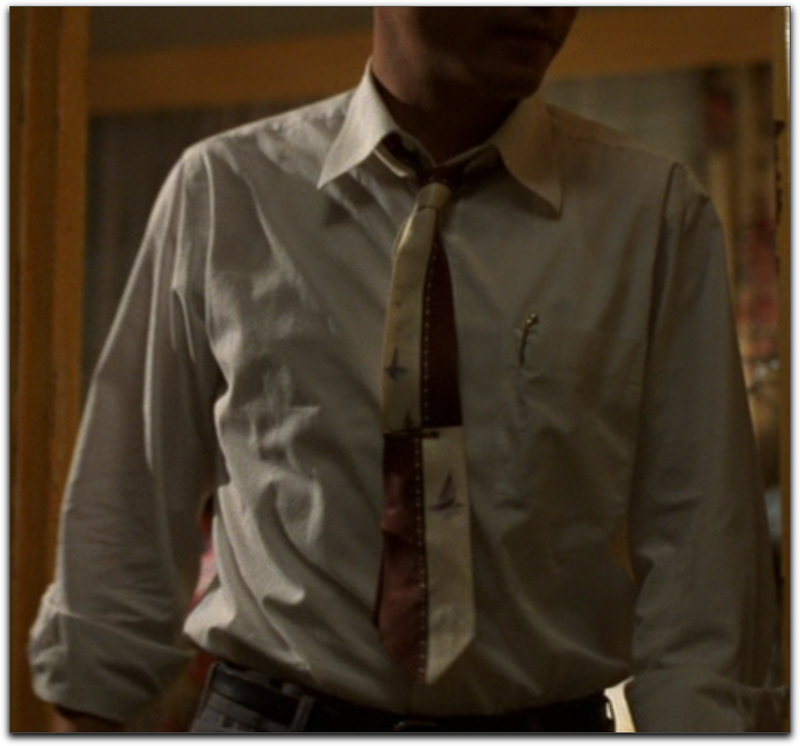 "Mad Men" started up again, so Mr. Chow is back with his mid-century Hong Kong ties. Android Jing from the scenes of Mr. Chow's serial. Androids can smoke because they don't get cancer. Another shot from the serial. And another. Lots of reds used for the futuristic stuff. Maybe to contrast all the green they use for the present. Mr. Chow is lost and floats from woman to woman, cigarette to cigarette, casino to casino. His hardened heart bleeds for no one. Ziyi Zhang’s character, Bai Ling, a neighbor in 2046, is a party girl who falls for Mr. Chow. I just like the shot of Bai's feet. They flirt. Check out the elbow length gloves. I love her red cheetah print with black flower. Hanging out by this sign, on the roof of the hotel seems to be a refuge of sorts for everyone. This is something most of us couldn't get away with now. Let's just throw this fur on to grab a drink. They party together a lot. 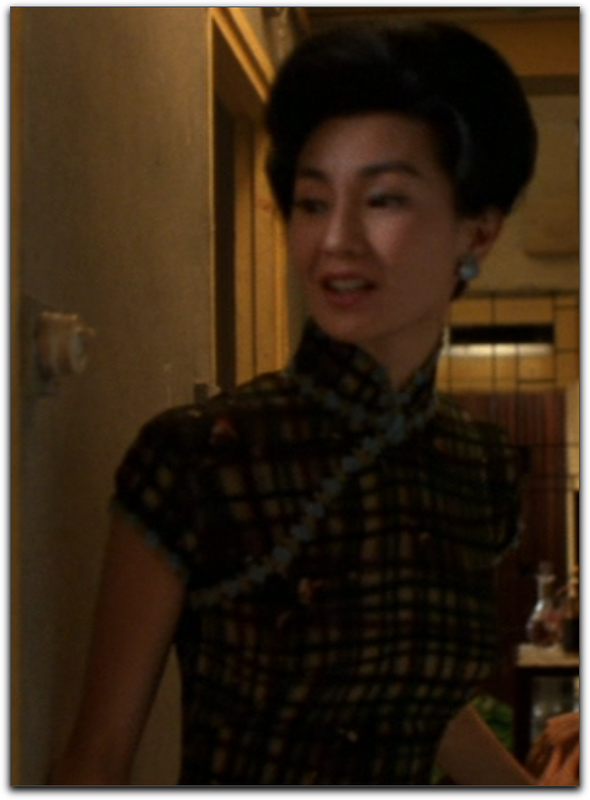 I love her cheongsam with the sequins on the front. She is hardly shy, why is she pushing him away? Maybe she senses something more serious on her end. I don't know if it's deliberate, but this has a "Breakfast at Tiffany's" feel. The pearls, hair, dress, and she's a party girl too, only this is the anti-Tiffany's, and the girl and boy don't end up together. He treats her like a prostitute, paying for their trysts. She jokes and gives him a discounted rate since he insists on paying. She wants him exclusively but he refuses. She leaves him but not without throwing money at him on her way out. He has boiled down his most intimate human interactions to transactions. Mr. Chow continues to bed women like this one waiting to join him. Bai eventually moves out, tortured by his games. 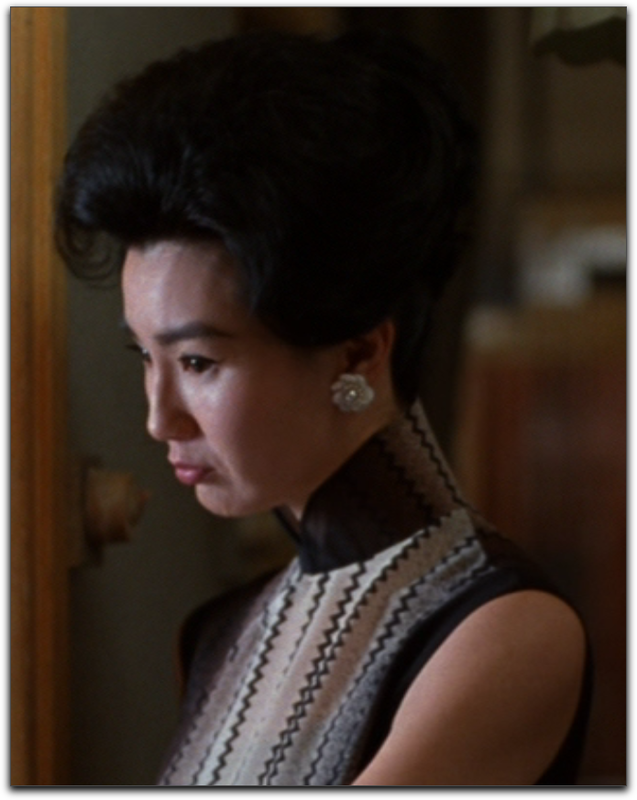 I like this shot because androids are used in the futuristic scenes as replacements for women, and with her reflection, it subtly says this woman might as well be a clone or robot sent to pleasure Mr. Chow. He won't give a second thought about her once she's gone. He'll just get another one just like her. Mr. Chow bonds with the apartment owner’s daughter Jing-Wen, Faye Wong. She is heartsick over her Japanese lover whom her father forbade her to see. They work on martial arts books together. Platonic relationships with women is where Mr. Chow finally shows some humanity. He offers his address so her Japanese lover can send her letters. This is a tough look to pull off, brown suit with orangey/rust tie. But he looks fab. He feels good by helping her. It gets him in touch with his humanity, and I think he gets a vicarious thrill helping true love blossom. Despite numerous women, Mr. Chow, alone again. 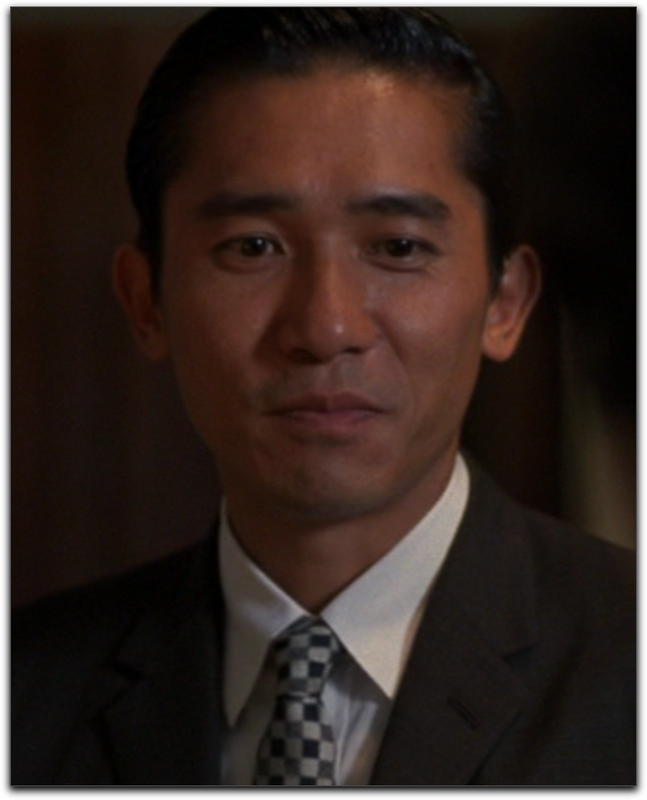 In his futuristic serial, 2046, Mr. Chow’s protagonist, a Japanese man, leaves 2046. He is the first to do so, and finds an android (Faye Wong) who looks just like his lost love to fill the void. Don't you love these light up soles? It’s as if all the women Mr. Chow has been with since Mrs. Chan (Maggie Cheung) have been androids, filling the void of his unrequited love for her. I love how this conversation is shot. 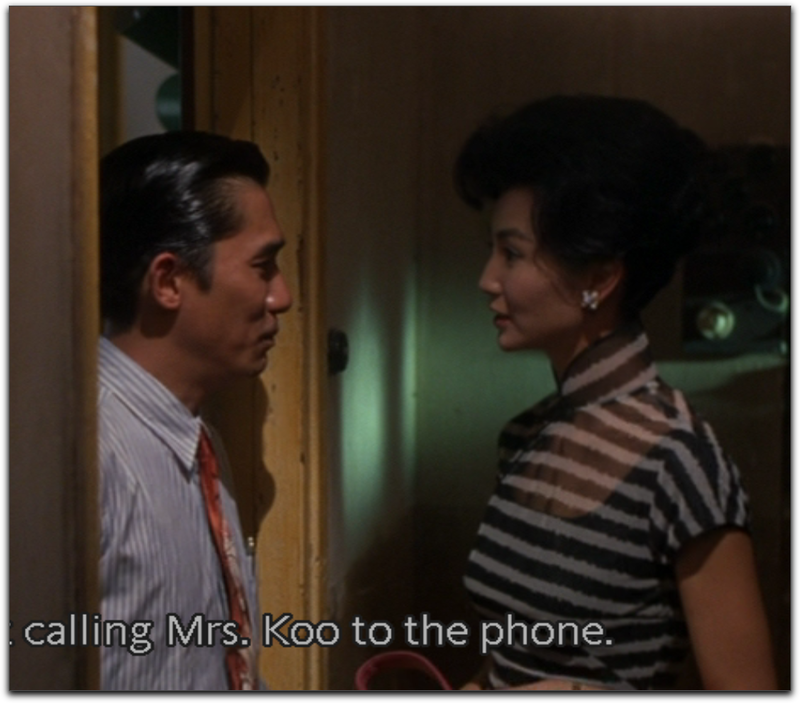 Mr. Chow convinces Jing to call her lover. When the camera pans, the reflections overlap and the effect is powerful. Mr. Chow is an author. He writes his character's destinies. Here he is "writing" Jing's destiny, and his role in fantasy and reality are morphing into one another. He watches Jing talk to her lover on a long distance call. The green and red lights in the background are Christmas lights, but they're also the main color story in the film. Bringing her happiness brings him joy. Maybe the act of bringing lovers together mends his wounded heart, or lets him feel a purity he lacks in his encounters. 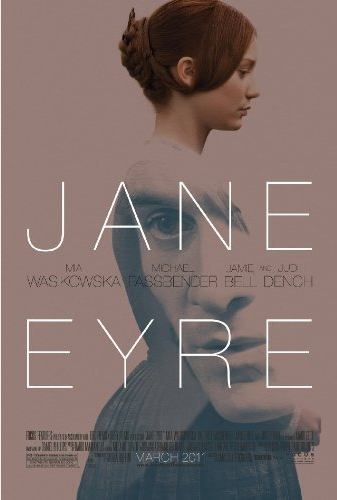 He has acted as a sort of author to their story, being the catalyst to their impending marriage. 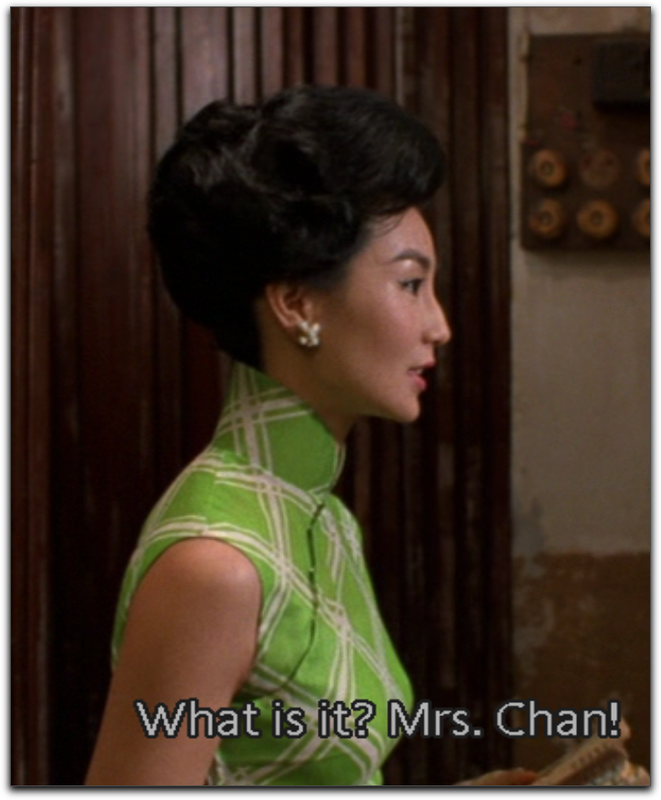 Mr. Chow meets Su Li-zhen, Gong Li, a professional gambler, in Singapore. 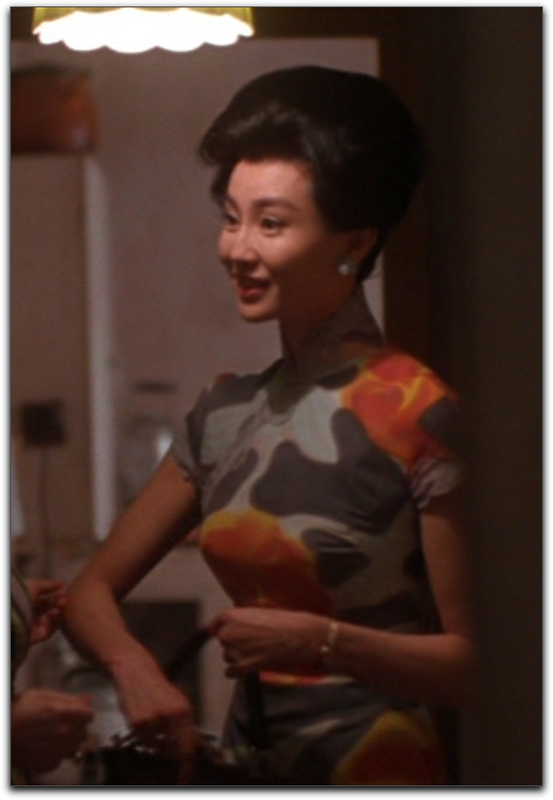 She coincidentally has the same name as Maggie Cheung’s, Mrs. Chan, the reason he left for Singapore. 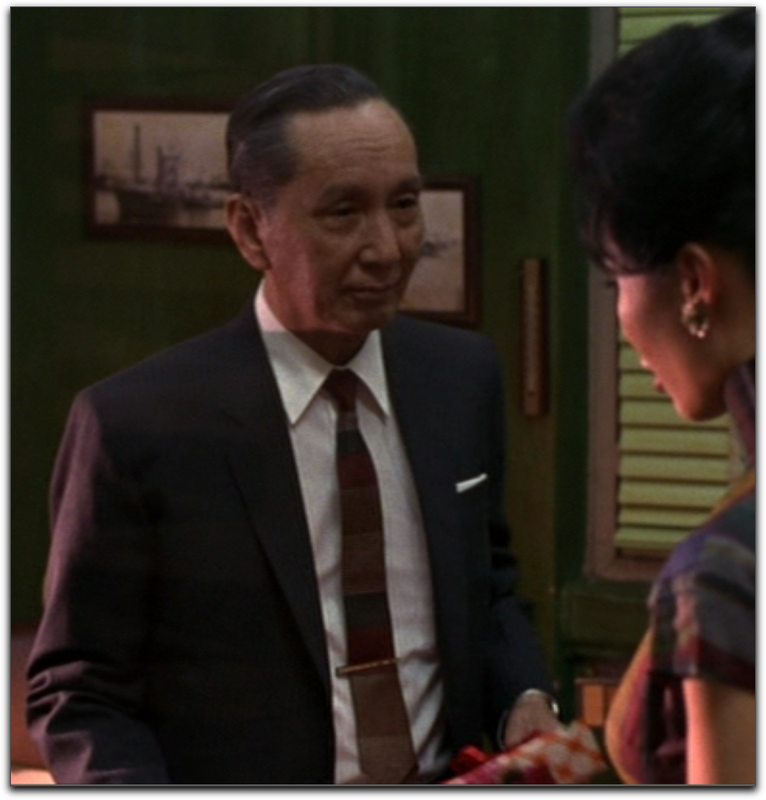 Ms. Su helps him win back his money to return to Hong Kong. The Singapore scenes are drab. No color. Mr. Chow has hit his low. I love the simple black blazer with the shortened sleeves, over her black lace dress. 2046 is really just a state of mind. Your mind can trap you into staying in the past because you long for the way it was, or because you were so traumatized by it, you cannot move forward. Either way, the past is not real, and we should not try to live there. In his serial his protagonist leaves 2046, whereas Mr. Chow is woefully stuck there. Aren’t we all just authors of our own stories? Will yours have a happy or sad ending? I don’t think this was received well, but I didn’t mind it’s meandering, multiple storylines, and threadbare narrative. Like a mink coat, I loved the look and feel of it, even it’s not popular to say so. Hong Kong, 1962. 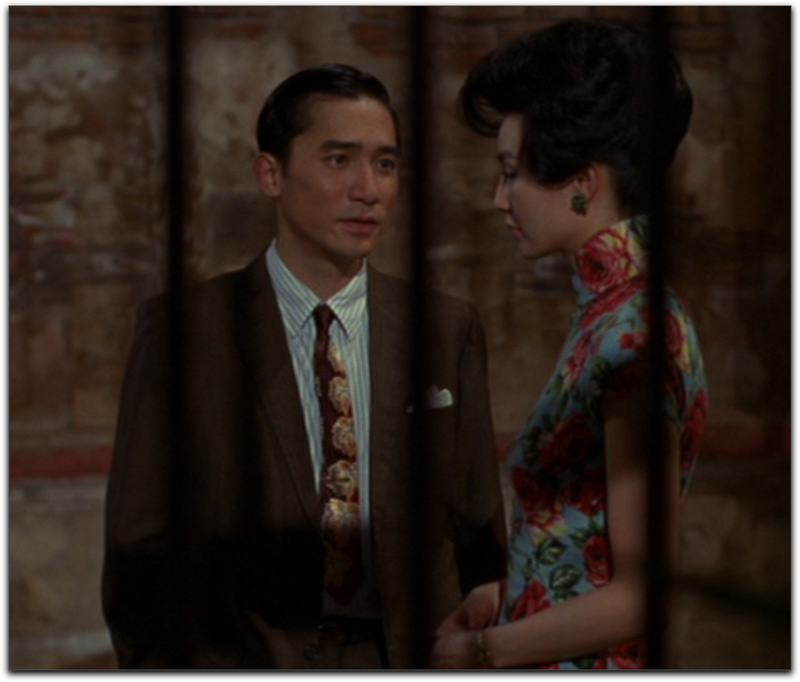 Mr. Chow, Tony Leung Chiu Wai, and Mrs. Chan, Maggie Cheung are neighbors in a noisy Hong Kong apartment building. Their spouses work late, or are out of town a lot so naturally they start spending time with each other. It becomes painfully obvious to them that their spouses are having an affair. Saddened, but self-righteous, they vow not to be like their cheatin’ spouses. They never consummate their love for each other, just luxuriate in the sexual tension. 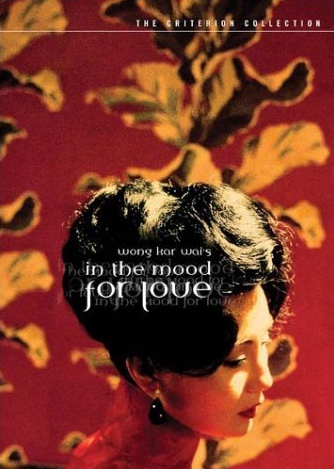 I think this is Wong Kar-Wai‘s best film. What can I say? I’m a sucker for a plot. With music I love a great hook and melody, too. I guess I’m a traditionalist. The story moves slowly, deliberately, to its unrequited end. 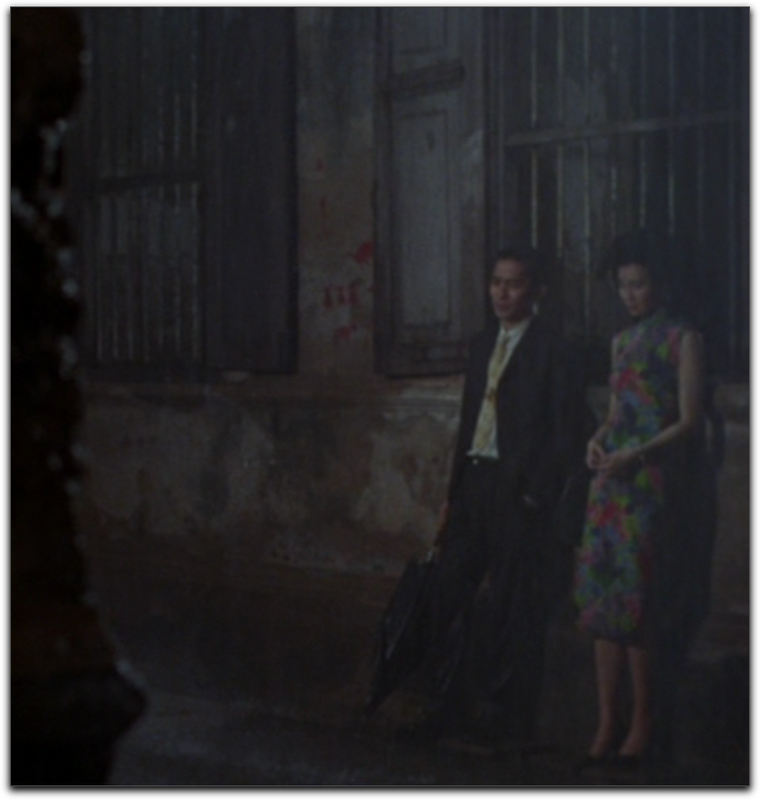 It’s beautifully, cleverly shot by oft-imitated, hugely influential Christopher Doyle (who also had a mad crush on Maggie Cheung.) Atmospheric without being indulgent. OK maybe a few cliches like, slow mo shots of the rain, and billowing smoke. But with him behind the camera, it feels fresh. Many shots from behind objects, around corners, through windows, over shoulders, as if we’re spying on them. Gives their relationship an illicit feel. But let’s talk about the clothes! 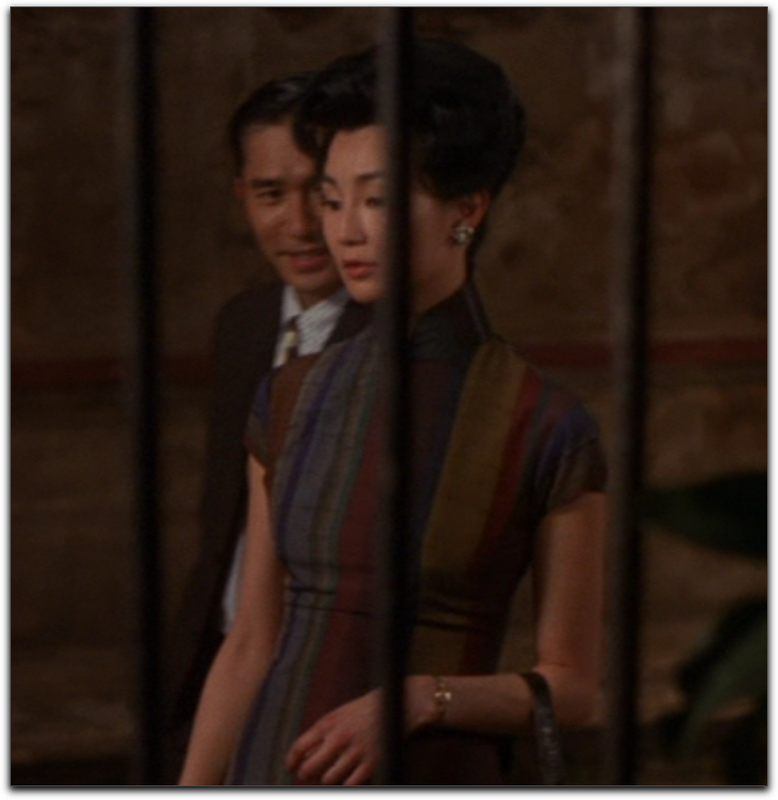 My God watching Maggie Cheung makes me wanna diet. She’s so tall and slim, everything looks divine on her. And let’s not leave out Tong Leung. First of all, what a handsome guy. And second of all, putting him in the 60’s suits and ties really does it for me. 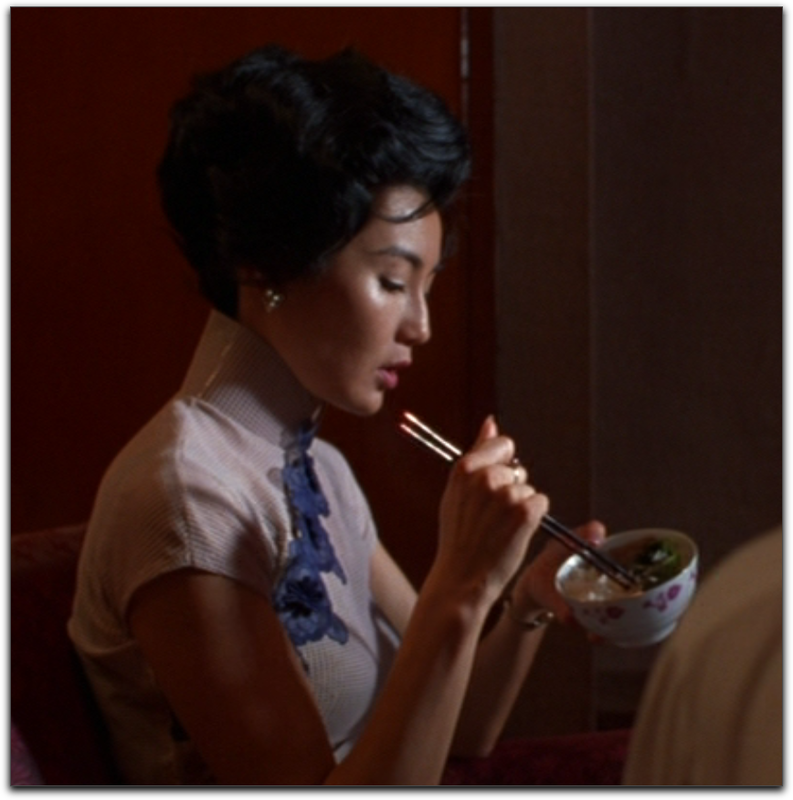 This was the “Mad Men” look more than a decade before “Mad Men” with a dash of Hong Kong flavor. 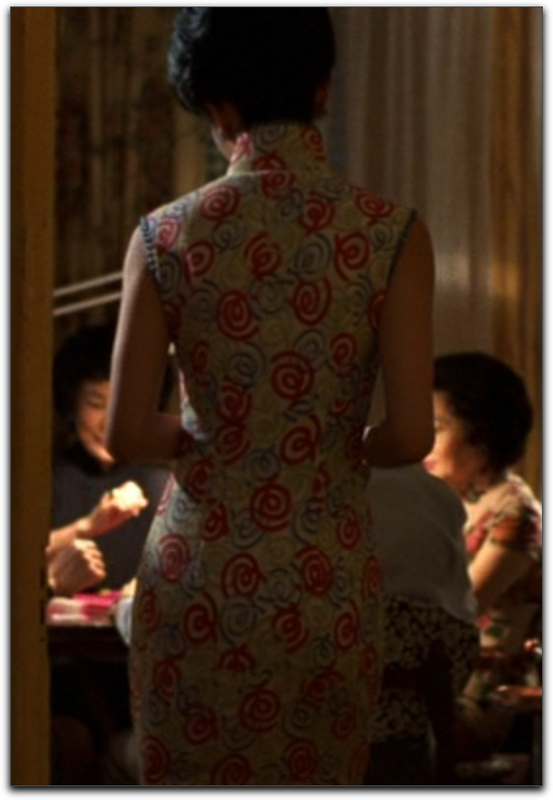 Love the print on this cheongsam. See? Put that cupcake down if you ever want to look this thin. The first furtive glance between them. I'm not sure if this is a knit or woven pattern, but I love it. Sort of a vertical Missoni. Notice the front of the collar is black. 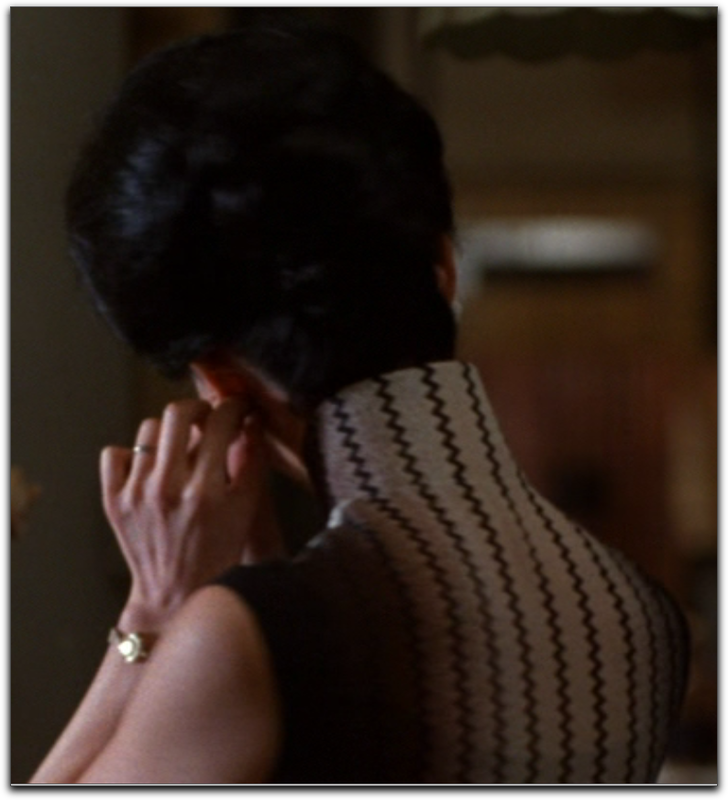 Notice the back of the collar flows into the bodice. They matched it to the back like wallpaper. Is she not the chicest secretary ever? Couldn't get a good shot of his tie. But you get the idea. Again, not sure if this is a knit or woven pattern. I think probably a woven, since they're usually made from wovens. In any case, I love the pattern. Even her older boss has a great tie. Aren't these the best widths? Not too skinny, not too fat. First of all, I love stripes, so this had me at first look. Secondly, it's sheer. Something different. They cross paths, avert their eyes. Violins sing longingly in the background. Nat King Cole croons in Spanish, gives it a European feel. The music sounds romantic, sultry when they’re together, plaintive and melancholy when only one of them is seen. 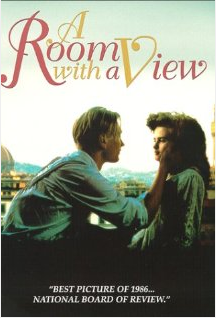 The instrumental music also reminds me of the music in “Room with a View” when Lucy, Charlotte and Ms. Lavish walk around Florence. Even the stuccoed buildings look vaguely Italian. I love men in a light grey suit, don't you? With a pocket square, no less. She's helping him write a martial arts serial. She gets stuck inside his apartment while the noisy neighbors play mah jong in the common area. She dare not leave or everyone will know what they're (not) up to. They role play. He pretends to be her husband, she "confronts" him about his mistress. Another great tie. Even better with the red coat. I love that this is a solid, but with a bit of floral detail at the edge. Unexpected and lovely. A classic! Costume design by William Chang. 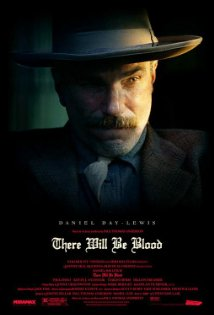 This dude also edited it and did the production design (unless there are three different William Changs working on this.) That explains the consistency of the look of the film. 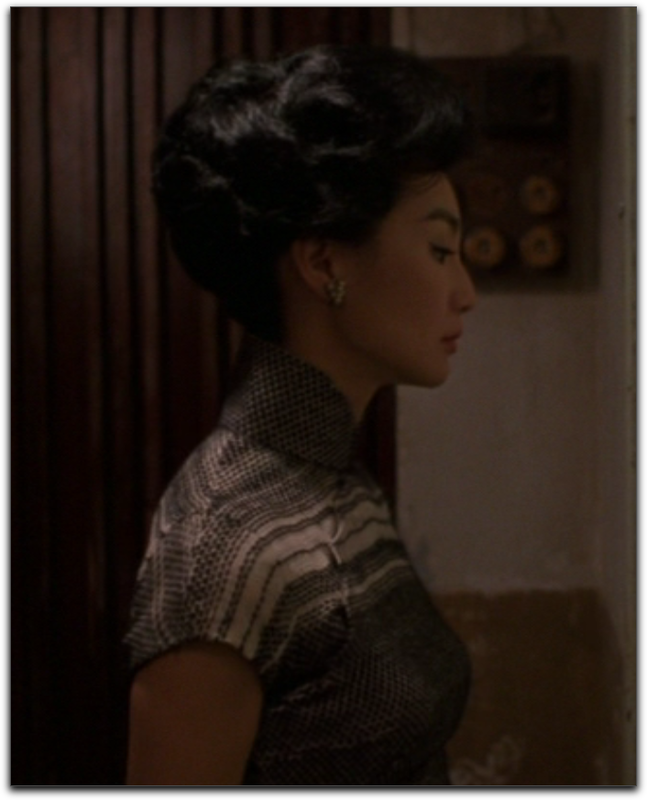 But no one thinks about William Chang, only how wonderful this Wong Kar Wai film is.